ATLANTA (AP) — After four at-bats, DJ LeMahieu was still looking for his first hit and felt he hadn’t made good contact. LeMahieu’s drive off Luke Jackson cleared the 400-foot mark — the deepest part of the park. 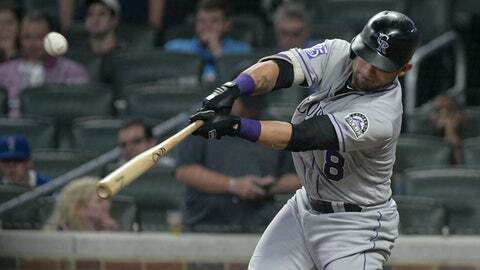 Carlos Gonzalez followed with a double and scored on Nolan Arenado’s single to complete a frustrating blown save for fill-in closer A.J. Minter. Minter has been Atlanta’s closer since Arodys Vizcaino went on the disabled list last month with shoulder trouble. Braves trainer George Poulis visited Minter on the mound early in the ninth to examine a cut on Minter’s left thumb. Minter said a fingernail caused the cut on his second pitch. Braves manager Brian Snitker described Minter, a rookie, as “still a work in progress” while mastering the command of pitches. Nick Markakis drove in two runs with a bases-loaded single off Antonio Senzatela with two outs in the third inning. Ronald Acuna Jr. had three hits and a walk, scored twice and stole a base. Acuna singled, stole second and scored on Freddie Freeman’s single off Bryan Shaw in the eighth. Braves: Snitker said LHP Max Fried (left groin strain) will make another rehab start before he’s able to return to Atlanta. He allowed three earned runs in 4 1/3 innings for Triple-A Gwinnett on Friday.